Here is the current Snowpack Summary. 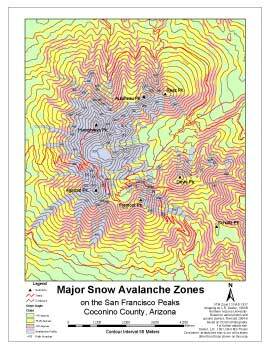 The map is made available as a public service to enhance the awareness of snow avalanches on the San Francisco Peaks. The map is designed to illustrate areas of potential major snow avalanche activity. 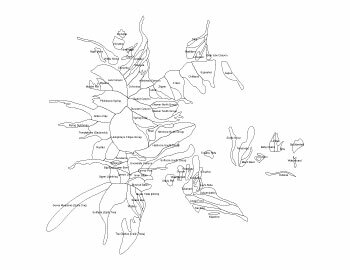 Since avalanches can occur on very short and localized slopes, this map does not show every possible location where an avalanche can occur. In addition, the original study was limited to elevations above 8000’. A good example of avalanche terrain not included on this map can be found along the Lockett Meadow Road where heavy snow years have produced small slab avalanches on slopes above the road. This document provides a descriptive key and metadata statement for an accompanying map of the same name.